Developing pain in your upper abdomen may leave you concerned that you have a digestive condition. If you develop upper abdominal pain after using psyllium, talk with your doctor to determine the cause of the pain. Psyllium is a fiber supplement used as a periodic laxative that can increase gas, which commonly causes upper abdominal pain. The pain may also be the result of indigestion and heartburn from using the supplement. If you develop abdominal pain along with chest tightness, you may have an allergy to psyllium. The formation of gas is common when you increase the amount of fiber you ingest daily. Psyllium fiber is made from a shrublike bush that produces seeds. 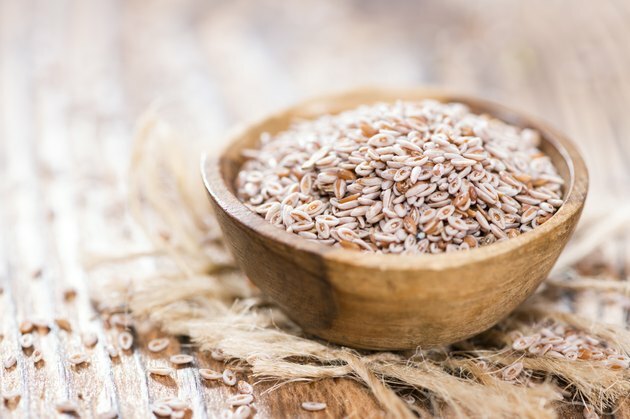 The husks of the seeds contain both insoluble and soluble fiber that is indigestible by the human body. When these undigested carbohydrates enter your colon, bacteria interaction results in the formation of gas. Excessive gas can become trapped in your intestines, causing bloating and pain in your upper abdomen. Gas pains typically develop quickly with sharp, jabbing pain and are passing gas or belching alleviates them, according to MayoClinc.com. PubMed Health states that stomach pain is a common side effect of using psyllium fiber supplements and that indigestion may cause the pain. Indigestion is the feeling of fullness after you eat. Heartburn may accompany it. Indigestion occurs when stomach acid enters the esophagus, resulting in a burning sensation, which is heartburn. Indigestion and heartburn from using psyllium fiber supplements should subside by using over-the-counter antacids. If you develop upper abdominal pain along with chest tightness and other symptoms, you may have an allergy to psyllium, according to Drugs.com. If your immune system malfunctions and reacts to the proteins in the psyllium husk as if they're dangerous, you will experience an allergic reaction. Allergy symptoms include abdominal pain, nasal congestion, vomiting, diarrhea, swelling in the face, throat or lips, a rapid heart rate, lightheadedness, chest tightness, trouble breathing, wheezing and skin rashes, such as hives. The pain may be unrelated to the psyllium supplement, but a sign of a more significant health problem. Upper abdominal pain may be the result of other digestive conditions, such as gallbladder disease or pancreatitis. If the pain persists or is severe, you need to call your doctor. If you've been diagnosed with irritable bowel syndrome, talk with your doctor before using psyllium to treat your symptoms.